“This in my recollection, is unprecedented. It’s quite a catastrophe and a lot of questions need to be answered." Mark McDonald, an expert in natural gas explosions, told the NBC10 Boston Investigators he could not recall a comparable incident with such widespread damage. Mark McDonald says high-pressure pipelines that carry gas into communities are fitted with regulators. If one of those regulators fails, there is a secondary one in place to protect neighborhoods, McDonald explained. He called the series the gas explosions in Andover, North Andover and Lawrence is "unprecedented." 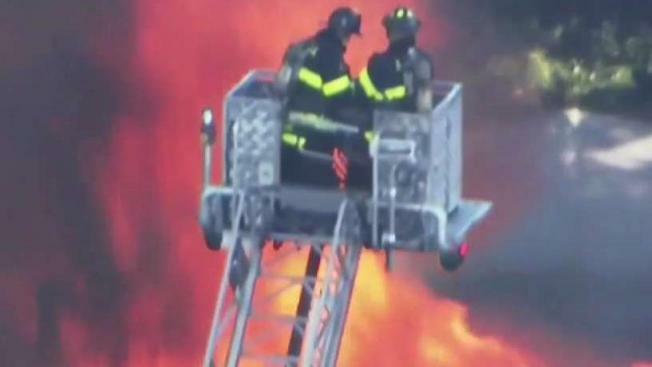 A series of gas explosions killed a teenager, injured at least 10 other people and ignited fires in at least 39 homes in three communities north of Boston on Thursday, forcing entire neighborhoods to evacuate as crews scrambled to fight the flames and shut off the gas. “This in my recollection, is unprecedented. It’s quite a catastrophe and a lot of questions need to be answered,” he said. McDonald explained that high-pressure pipelines carry gas into communities. There are regulators in place that reduce the pressure to a mere fraction by the time the gas reaches homes and powers appliances. Even if one of those regulators fails, there is a secondary one in place to protect neighborhoods, he explained. It’s too early to know if human error or equipment failure was the cause of the incident. But McDonald said the century-old pipeline infrastructure in Massachusetts certainly puts the area at greater risk.